Percepta prides itself on continuous improvement, ensuring we strive to develop the solutions we deliver for each Client. 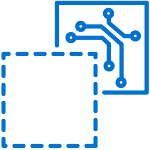 Key to this methodology is identifying where technology can enhance the service we deliver, from utilizing our Clients’ existing systems to developing new tools. In each case, we see technology as a key enabler, developed and used in conjunction with motivated and empowered employees and a well-designed customer-focused strategy. A challenge faced by our Premium British Automotive Client was the lack of understanding of the number of car hire “events” or instances where customers’ vehicles were off the road and a replacement vehicle has been provided. They struggled to report on these events and in turn, had little visibility over the cost of each off-road incident. Our solution was to develop a simple tool, to be implemented into the existing Customer Relationship Center (CRC), which would allow our Client to map, monitor and effectively manage these customer cases. 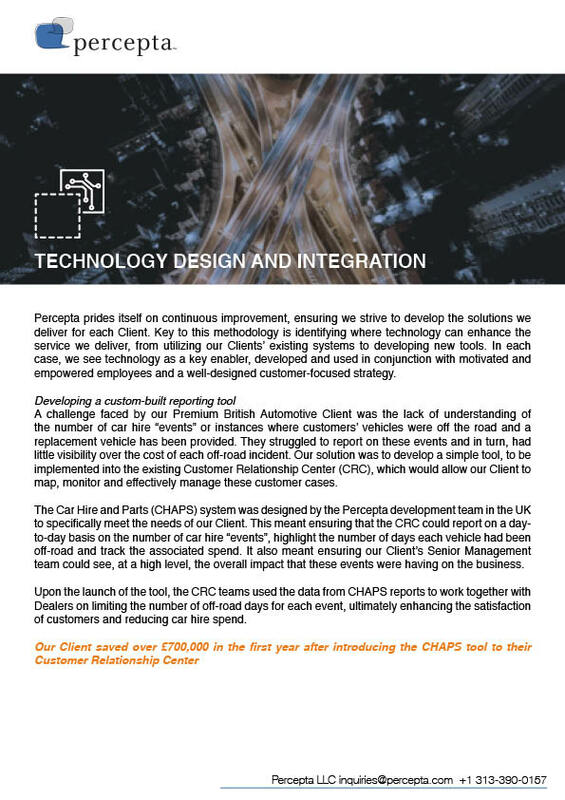 The Car Hire and Parts (CHAPS) system was designed by the Percepta development team in the UK to specifically meet the needs of our Client. This meant ensuring that the CRC could report on a day-to-day basis on the number of car hire “events”, highlight the number of days each vehicle had been off-road and track the associated spend. It also meant ensuring our Client’s Senior Management team could see, at a high level, the overall impact that these events were having on the business. Upon the launch of the tool, the CRC teams used the data from CHAPS reports to work together with Dealers on limiting the number of off-road days for each event, ultimately enhancing the satisfaction of customers and reducing car hire spend.